With E3 being the big show that it is, it still manages to hold many surprises, if you look out for them. In my case, most of these usually come from a visit to the Los Angeles Convention Center’s Concourse Hall, where smaller developers show their wares and aren’t as in-your-face as the booths in the other two halls. Such was our appointment with Eurovideo Medien, who brought two games to E3, one of which was The Dwarves, a top-down isometric action RPG by the folks at KING Art Games, the same studio behind the awesome The Book of Unwritten Tales series. It’s based on Markus Heitz popular series of high fantasy but incredibly humorous novels. The same dark humor from the novels snuck its way into the game, which follows the plot of the first book. It tells the story of Tungdil, a dwarf raised by humans who has never laid eyes on another dwarf in his life. All’s well until the day he’s sent by his foster faster on an errand that goes awry, leading to his meeting with other dwarves, two warrior siblings, who lead him to quite an adventure. The demo we got to check out with Eurovideo Medien’s PR manager Florian Emmerich took us through the first few bits of the game, where the hammer-wielding king of the dwarves had to defend his keep against a greenskin attack. The core gameplay looked quite familiar, and felt really akin to more action focused overheard RPGs like Diablo and Torchlight at first glance, with the added ability to pause the chaos and plan out, like a tactical RPG. But as the demo went on, it showed some shades of games like the old EA Lord of the Rings‘ brawlers thanks to its focus on more than a single playable character. When the king inevitably fell during a dramatic cutscene, Florian took control of the king’s son, who had an entirely new set of skills, sending goblins and trolls flying off a bridge that happened to be the last defense before the dwarves’ fortress wall. Sending things flying was one of The Dwarves‘ most notable features, not just because of the big crowds of enemies, but especially because of two words that were shared in regards to its co-op mode: friendly fire. Much to the chagrin of little brothers worldwide, The Dwarves‘ will feature local co-op that allows players to grief each other, but that will hopefully incentivize cooperation in the long run, with the inclusion of many powers and skills that can be used in conjunction, throwing in a tad of Magicka into the big pot of features in the game. A bigger slice of the world the game takes place in was shown when the demo looped back to Tungdil, just as he got ready to leave his human home and go off on his soon-to-be adventure, after a short talk with his foster family. 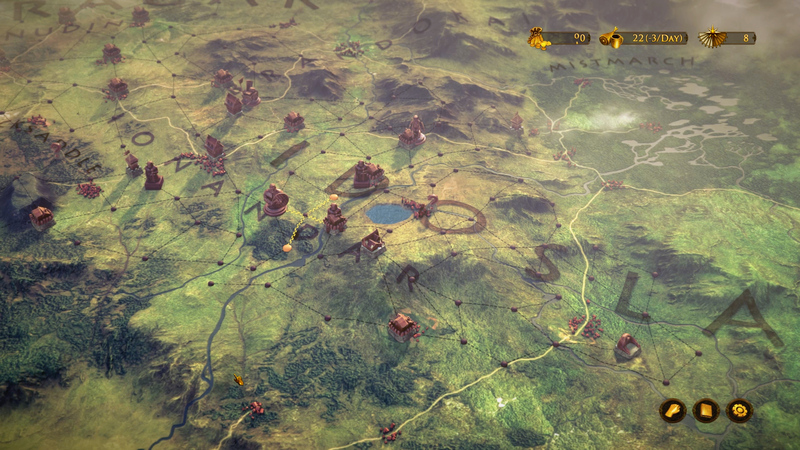 We got a good look at the world map, which is pretty big and is charmingly portrayed as a tabletop diorama, where enemy encounters can still take place. It didn’t take too long for our dwarf friend to run into trouble, a few greenskins who attacked some travelers and were ready to do the same to him. A quick dialogue prompt showed a little of the game’s witty writing, giving the option to try and sweet talk them, or simply throw down and brawl, the latter of which was our way of thinking that day, the last of E3. Surprisingly enough, our hero isn’t much of a fighter at that point in the game, being a blacksmith and all. His axe swing bounced off its target’s armor, and he was about to be killed when his bacon was saved by the aforementioned twins. 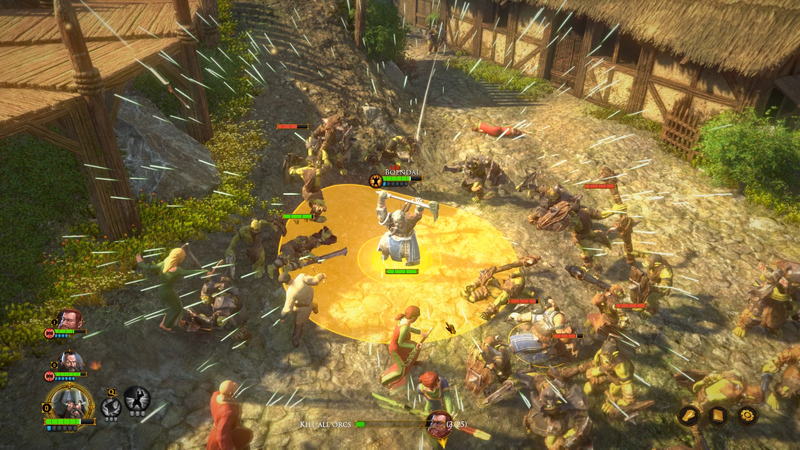 That’s where the demo’s final part showed more of the co-op mechanic in the game, with Florian switching between the three dwarves, coordinating attacks with the computer controlled characters, with of the twins being more tank like, handling big hits to drawn in the attention of the enemies, and the other’s more focused on quick hitting and burst damage dealing. While not totally original in its gameplay, The Dwarves‘ felt really tight during that demo, which was running an alpha build of the game, available now for its successful Kickstarter backers and a limited number of testers. I’m hoping to jump into it at some point before it’s out sometime next year and share more detailed impressions, but as it stands, The Dwarves‘ is certainly on my radar.